(10) From the Farm Shop Car Park turn left into Old Crawley Road and right after about 100m onto a footpath that leads down to the A264. Carefully cross both carriageways and onto Wimland Road on the opposite side. Over the railway bridge turn left (9) and continue past Owlscastle Farm until there is a metal gate on the left where the path continues to the right along the side and across a field. Continue over a footbridge (8) and right along the side of the next field. The path continues to the left through trees and around and under the dual carriageway and back along the other side. Turn left by the side of Roffey FC building (7) and continue along Bartholomew Way. (6) turn right into Lemmington Way and at the end turn left into Rusper Road. After about 200 m on the right the walk continues on a pathway through the trees (5). (5) Go left up Rusper Road and turn right at the roundabout into Lemmington Way. At Bartholomew Way (6) turn left and go around to the left of Roffey FC building (7) and over the footbridge. Follow a path to the right which leads to the railway line and goes under and back along the other side of the dual carriageway. Where the path opens up turn right to keep to the left hand edge of the field. Reach the footbridge (8) and turn across the next field. Follow the path to the right and along to a metal barred gate and follow the track to the right past Owlscastle Farm. (9) Go right along Wimland Road and carefully cross the rail crossing and up to the A264. Cross both carriageways carefully to join a footpath on the other side. 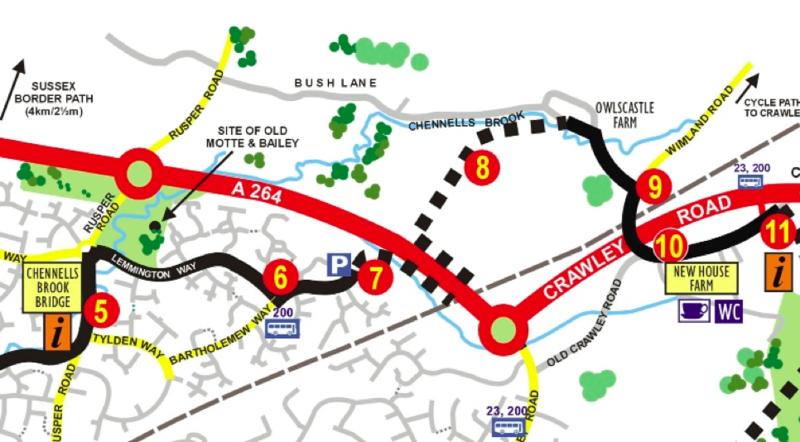 Turn left into Old Crawley Road and New House Farm Shop is on the right (10).